The owners of the new Terre Haute Rex baseball club have an incredible opportunity in their mitts to break new ground in the world of baseball franchise branding and marketing. If done right, the club’s new moniker could make even the most seasoned top executives in the professional ranks turn their heads. Earlier this month, it was announced that the Prospect League, one of the top summer collegiate baseball league’s in the country, was expanding from 11 to 14 teams in time for the 2010 season. The three new clubs include the DeKalb County (Ill.) Liners, West Virginia (Beckley) Miners, and the new franchise in Terre Haute, Indiana. Liners and Miners? Yawnopotomus! Beyond the nicknames themselves, DeKalb and Beckley have already unveiled their logos, which teeter on amateur and leave much to be desired in the uniqueness and creativity department. Don’t expect national attention here, nor branded merchandise sales beyond the local markets. In Terre Haute, however, the team identity game has been positioned quite a bit differently. Whether this was a slick strategic maneuver or mere circumstance doesn’t really matter. The reality is, the cards have been dealt, and it is a pretty darn good hand. Now it is time to play. As has been reported, the Terre Haute team is owned by Sycamore Foundation Holdings, a nonprofit subsidiary of the Indiana State University Foundation. In partnership with Clabber Girl Corporation, the team has been named the Rex, after Clabber Girl’s popular Rex® Brand Coffee. What? A team named after a corporate brand? Has America’s Pastime gone the way of Japan or South Korea, where corporate owned and branded professional baseball teams like the Kia Tigers are the rule, not the exception to the rule? Not since the days of the old industrial leagues from the early 20th century, when names like Firestone and Goodyear donned professional uniforms, have we seen anything resembling a corporate name or moniker on a MLB or minor league-level cap or jersey. Sure, we have Little League teams across the country with names like Squints Pharmacy and Needman Realtors (see The Sandlot 3); and the Colorado Silver Bullets, a women’s baseball team once-sponsored by the Coors Brewing Company, traveled all over America playing exhibition games during the 1990s. But your own pro-style team in your own back yard being hijacked by corporate America? Blasphemy! Nonsense. The partnership is actually quite nifty and truly unexpected at any level of ball. Whether anyone locally realizes it or not, the little team from quiet Terre Haute has just one-upped the entire baseball industry. The move by the owners to partner with Clabber Girl was a bold and unique one that is worthy of national attention. First, it allows the Rex® brand to be uniquely marketed throughout the Prospect League’s broad footprint from Illinois to Pennsylvania. And now the iconic, all-American Rex® brand will be forever tied to the all-American hot dog, apple pie, and clean-cut collegiate boys of summer. Secondly, the Rex name is inherently cool and marketable for a baseball team. It’s not like we are talking about the Terre Haute Pop Tarts or Liquid Plumrs here. The name also sports an “X” just like traditional baseball staples “Sox” and “Rox.” And the name is also interchangeable with “wrecks,” as in a future headline that reads: “New team ‘wrecks’ opponents on opening day.” So go ahead. Embrace it. See what the owners can do with the team’s new identity to make it fun, creative, and worthy of your undying loyalty. Now that Terre Haute has the team and a nickname, the real trick will be executing with precision the development of a unique, top-of-the-line primary logo that will drive a highly professional first impression, ignite a deep-rooted and long-lasting love connection with fans, and cook up a theme-based marketing and entertainment smorgasbord that will create buzz, fun, energy, and excitement that is sure to put fannies in the seats and unleash a merchandise feeding frenzy. From our perspective, a team’s primary team logo should be traditional/vintage or modern and cutting edge. Anything in between is nothing more than a missed opportunity. For the Rex, the door is wide open to go either direction. In fact, the team could go both ways and double the available merchandise, if primary and secondary marks were adopted. Because Rex® Brand Coffee is a classic brand with a long-time loyal following, it lends itself to a subtle or prominent incorporation into a vintage team logo. The moniker for the Oklahoma City Redhawks is a fine example of a well-executed vintage design that was recently created. Clean, simple, timeless. On the other end of the spectrum, the Rex name also lends itself to a more modern, kid-friendly, mascot-oriented approach. Pondering the obvious, the T-Rex dinosaur would make the perfect mascot to compliment the Rex® brand. Can you envision a logo with a T-Rex grasping a cup of coffee in one claw and holding a baseball bat in the other, with the Rex® coffee brand strategically incorporated into the design? 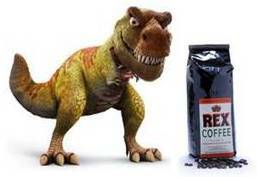 The look on the T-Rex’s face could be tough, grumpy, happy, fired-up, or mischievous, depending on the desired melding of the mascot to the Rex® product. The name of the mascot would obviously flow from the team’s new identity. Names like “Joe” (cup of joe), “Jitters” or “Tweak” immediately come to mind. The team’s newly renovated home on the Indiana State University campus could also get a christening with a formal or informal nickname (at least during the summer) to further drive home the theme. The ballpark could be cleverly known as “Jurassic Perk” at Bob Warn Field, which could appear as logo signage at the ballpark, on the team’s website, and all team marketing materials. There are many other ideas out there to maximize the coffee-dino connection, but you get the picture. Indeed, the owners of the Terre Haute Rex have taken the first step toward the cutting edge by naming the team after a valuable and wholesome corporate brand. By taking the strategic next steps, they have a clear opportunity to elevate the team to the national stage and drive merchandise sales – and Rex® coffee sales – far beyond expectations. Alan Poff is the founder of Ballpark Business (www.ballparkbiz.com), an online news and information resource for baseball industry professionals. How have the Rex been since the 2013 season? The ballpark is a college venue and probably does not have the social areas that bring out crowds who may not be the biggest baseball fans. Also, folks in the Wabash Valley can be fickle and not always supportive of local sports teams in towns, but I can’t believe that these folks wouldn’t want to come out to enjoy a night out during the summer at a ballpark with the right elements. Actually, the team and the league have had quite a bit of success in Terre Haute and the surrounding areas. Terre Haute has welcomed the team with open arms and has shown strong support. It certainly hasn’t been a “horribly missed opportunity” to be honest. It’s been well welcomed by the community. The team was created as a way to make money for the ISU Foundation. The plan had always been to sell the franchise within 3-4 years. The ISU Foundation never had any intention of going any further than that time frame. The team was created to resell for a profit within that 3-4 year time window to raise money for the foundation. That was the plan all along and… mission accomplished by them, as they ended up selling the team for over twice what they had in it. I hate to be harsh here, because I want to team to do well, but the logo is horribly amateur. In fact, when it was unveiled, I literally recreated it in 10 minutes, and I am not a graphic designer. The owners should keep the name, but I highly recommend that they work with a sports logo designer like Dan Simon (StudioSimon.com) to develop a professional and more lucrative branding presence. I guarantee fans would notice. Just curious — did the Rex have a mascot before the one announced a week ago (http://www.youtube.com/watch?v=4UN8FM02wbs&feature=youtu.be)? If not, another missed branding opportunity at launch. Whataver the case, good luck to the Rex and their new owners. Thanks for the heads up. I didn’t realize there were problems in Terre Haute. Too bad. It was a horribly missed opportunity. The logo itself is so bad and amateur that I was actually able to recreate it myself in PowerPoint (yes, PowerPoint) in about 10 minutes the day after it was unveiled. To be clear, I am not a logo designer. Let’s hope someone new steps up to the plate and saves the team. I always saw this post but never read it until today. After going to the Rex site it looks like they went in a totally different direction.